We both feel that the best place to start is by making a list, so this is what we did. Over a couple of days this became separate lists; Where we want to eat, what we want to do, places we want to visit, how much things are going to cost, and more. These are just our first an initial thoughts. We do know that we want to stay in self catered apartments as there are MANY MANY restaurants that we really want to go and try out. Knowing this and knowing the dates that we want to go made looking for the holiday a whole lot easier as we could filter it down. We knew for sure that we want to go around the end of January (we are hoping that it will quieter than normal, but that it will not be freezing cold). After having a look around online it turned out that Virgin Holidays offered the best deal for what we wanted. With this booking we got; the flights, an apartment and a car (as well as the car insurance). It still took some looking through as we wanted to be staying close to both the Disney and Universal parks, but having a car meant that we didn’t mind if it was going to be a 10-15 min drive. 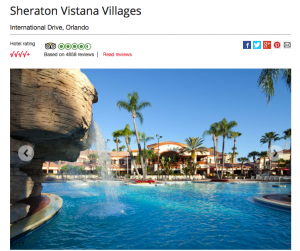 Sheraton Vistana Villages looked to be the best place for us, it is on International Drive which means it is close to all the parks and it is close to shops and restaurants. Like others we checked it out on Google Maps and had a look at what would be in the local area that we could just walk to or take a quick drive to, and as most people know there is a lot on International Drive so we were very pleased. As you can see from the map it is just above Disney, which means it is in the middle of Disney and Universal, perfect because I cannot wait to go to Disney and he cannot wait to go to Universal – we will have to discuss which we will be going to first! Our flight is booked for 11am which will mean that we will land at 3pm (due to the time difference) on the way there. However on the way back we will be leaving around 6pm (in America) and will land the next day at 7:30am (UK time). We will need to sleep on the plane on the way back as I think this will be a more significant time difference than on the way there. We will be writing more about the plan for our flights and the airport in another post. With the booking we got a car, we opted for the Mitsubishi Mirage (Economy Car) (4 door). The issue with upgrading the car meant that the insurance would also go up. The insurance is tricky because there is a standard insurance (that allows you to drive the car but does not cover for any damage, any airport fees, taxes etc). Then there is like a middle insurance (this covers any damage to the car and allows for another driver, plus includes the fees). Then finally there is the most expensive insurance (this allows up to an additional 4 drivers). We have chosen to go for the insurance with 1 additional driver and covers for any damage because our theory is that if someone damages the car whilst it is in a car park then we do not have to worry about it – it is not your own driving that you need to worry about but other peoples as well. Plus when we spoke to Virgin about additional fees, we quickly realised that it was actually cheaper to pay for the slightly higher priced insurance, than the lower prices insurance and then paying the fees separately. So watch out for that! These additional fees include; airport fees (we still haven’t actually found out what these are, but don’t want to risk how expensive they could be), state fees (these are different depending on the state you are in). When booking the holiday and including the car Virgin Holidays simply list them as additional fees, we only found out about them because we had a look at other 3rd party websites for the car and car insurance. So make sure you look around and get all of the information you can before you fully book.